The My Sales Metrics and My App Analytics modules allow you to sync your iTunes Connect and Google Play Developer Accounts with Sensor Tower so that you can conveniently view and analyze all your relevant performance statistics in one platform. Quickly navigate between your Downloads and Revenue data and other key metrics such as Category Rankings and Keyword Rankings. These features allow you to explore and compare data from the app store's platforms and Sensor Tower's platform without leaving Sensor Tower. 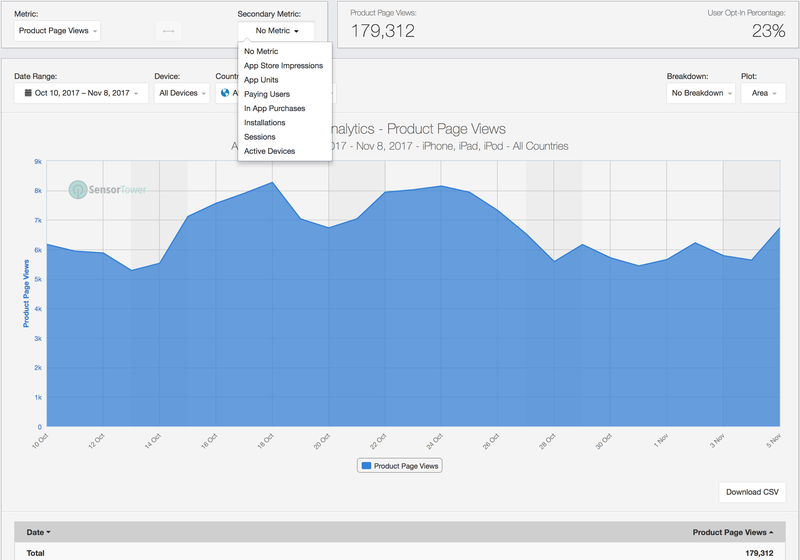 In My App Analytics, you can slice and compare metrics such as app store views, installations, sessions, and more, all in one place and without having to visit your iTunes Connect dashboard. Please note that this module is only available for iTunes Connect accounts.